This article originally appeared in the Rifleman’s Journal website. Many of you have doubtlessly read Bryan Litz’s articles in our Daily Bulletin and on his Applied Ballistics website about various current long-range bullets. Bryan’s work carries a great deal of weight in the world of ballistics, so his comments (and mathematical proofs) regarding the benefits of bullet pointing certainly caught my attention. Bullet pointing, like meplat trimming, is an effort to reduce the ballistic inconsistency created by the somewhat jagged tip of the jacket where the bullet forming dies bring it to a point in the manufacturing process. Of course, we could eliminate this problem altogether by shooting closed-tip, open-base bullets like the Lapua D46, but that merely shifts the jacket problem to the other end of the bullet. In any event, hollow point bullets rule the accuracy world today, so John Whidden, multi-time National Long Range Champion at Camp Perry and a talented gunsmith and designer to boot, came up with a very handy tool to let us make those hollow points pointier. Let’s have a look at John’s tool and see how it works. The Whidden Bullet Pointing Die System uses a Forster bullet seating die body as its basic structure and that’s a good choice given the quality machining Forster does on these. The real heart of the tool comes in two parts: the caliber sleeve and the pointing die that fits inside the sleeve. In fact, to point up different caliber bullets, you only need to change the caliber sleeve, everything else remains the same. The last item is the bullet base that slips into a standard .308 shellholder and supports the bullet as it goes into the die body. It took me less than five minutes to get everything set up, including changing the caliber sleeve from 6mm to .30 caliber. John’s instruction sheets are well illustrated and clearly written; you should have no problem getting up and running. Pointing the bullets is as easy as sizing a piece of brass. You can see in the top photo the difference between a few pointed bullets and a few un-pointed ones. The innermost pointed bullet in the picture was my first attempt and I adjusted the die a little after that, you can see that the others are closed a little more. John even includes a couple of sample bullets so that you can see one done right and one done wrong. That is a nice addition that can help you achieve the desired results. I think Bryan’s work supports the validity of this concept and John’s tool puts it into practice in a simple-to-use manner that makes it just about impossible to do any damage to the bullet. I have shot pointed bullets in various calibers at many matches now. Pointing is not a “miracle cure”, but I believe that pointing bullet tips can produce long-range accuracy gains, through reduced vertical dispersion, for many popular types of match bullets. The Whidden Bullet Pointing Die System retails for $220.00 (with one insert). Additional die inserts are $42.00 each. Extra caliber sleeves are also $42.00. You can purchase directly from Whidden Gunworks, or from Sinclair International. Share the post "Whidden Gunworks Bullet Pointing Die System"
Got Bipod? If you’re in need of an adjustable two-legged friend for the front of your favorite rifle(s), Midsouth has you covered. Right now Midsouth Shooters Supply has a wide selection of Harris Bipods in stock at attractive prices. For example, the Harris 6″-9″ BR model with leg notch is just $69.68. That’s ten bucks cheaper than we’ve found elsewhere. From small to tall, Midsouth carries Harris bipods for your intended applications. Midsouth also sells a variety of authentic Harris mounting adapters, including rail adapters, and flat fore-end adapters. 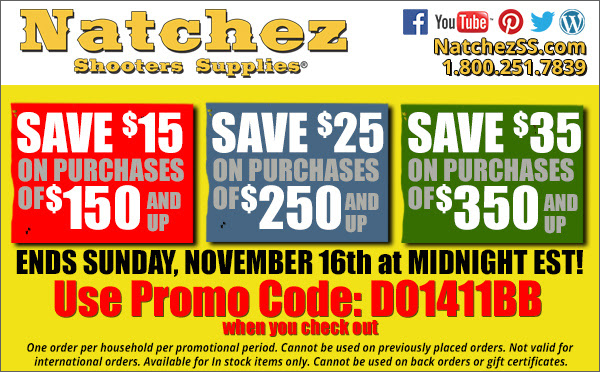 Share the post "Harris Bipods on Sale at Midsouth Shooters Supply"
Share the post "Promo Code for Natchez Shooters Supply"